­Climate change is a hot topic. The people of The Netherlands came together in Amsterdam to protest during the biggest Dutch climate march to date. On the subway from the North of Amsterdam to the city center people are carefully carrying their meticulously crafted protest signs. Some are made of sturdy plywood, others on the back of what used to be the side of a moving box. Sturdy or weak, most of the signs have a message for today’s climate march that is painted on in thick smears of acrylic paint or scribbled on with a marker. As the metro empties at the Rokin subway station the crowd moves up to where the world is wide awake on this bleary sunday afternoon. The sky is pouring down in fat, cold, droplets that gather in puddles on the pavement and create swimming pools by the edge of the road and miniature gutters of the tram rails. Dam Square is where it’s about to happen, or it is already happening. 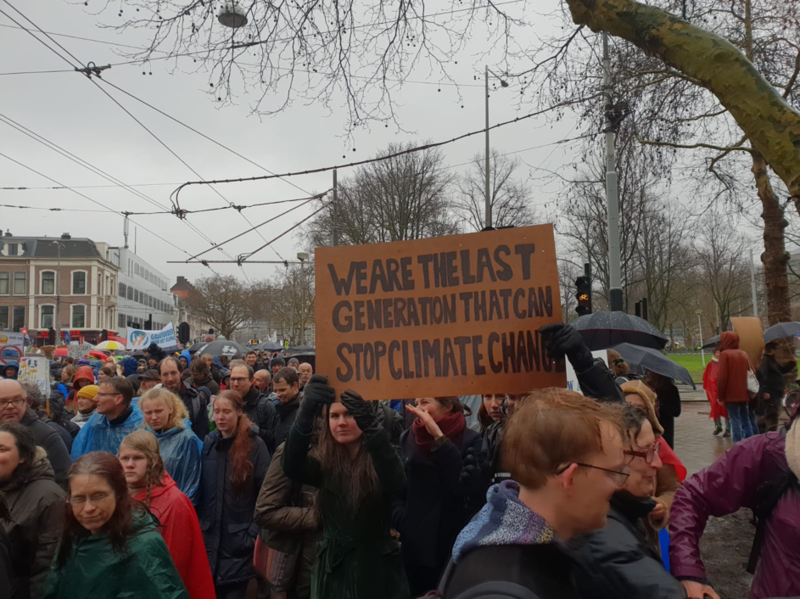 A crowd of hundreds has gathered on the slippery grey cobblestone, all the way from the palace to the Dam Square monument to protest climate change. New people seem to emerge from every street around the square and take up every available inch, wedged in between luxury department store Bijenkorf and the golden arches of McDonald’s on the other side of the road. The rain never seizes, almost as if heaven itself is crying for the state of the earth. Or happy tears for what are now thousands of people gathered to protest the way the environment and climate are treated. The Climate March is an old fashioned solution to attract attention to a modern day problem. Polar ice caps are melting, bees are dying and the seasons are shifting more and more with each passing year. As old fashioned as the idea of a protest march might be, it seems successful. The turn up is astonishing. Everybody in attendance seems to understand the relevance and severity of climate change, they are gathered here with purpose. There is finally movement after some roars from the crowd and chants that call for the march to start. People are belting out of tune protest songs, shouting “climate justice, now!”, and raising their protest signs high. Some groups carry professionally printed, glossy banners. One of these groups is Stand Up For Science. Their purple banner reads clear: “Science denial is NOT a climate policy, we stand up for science”, not is emphasized in bold, orange lettering. A young woman in glasses and her hood drawn up proudly holds the corner of the banner. Zsuzsika explained why she was braving the elements and marching for the climate: “We specifically are here because we see a lot of science denial when it comes to climate science. We are all scientist and we don’t like that people deny climate science”. Her eyes become sterner, it is clear that she takes this issue to heart: “Science denial is not a policy. It is very important what scientists find when it comes to climate change. We should take it seriously.” Zsuzsika and her group of scientist confidently continue the march and chant about their cause. A bit further on there’s a minivan blasting music through its speakers. The march almost feels like a street party instead of a political standpoint. A man with a sign that has a website link on it sticking out of his backpack is waiting on the sidewalk. He says that he isn’t part of the march whilst his eyes dart from left to right, he doesn’t want to talk. A quick Google search for his website link shows a conspiracy blog that preaches about cannibalism and mind control and thought slavery. Back in the throws of the march there’s a man holding up a small sign for Milieudefensie. Mark has his hood drawn up to protect him from the rain that is still pouring. He is part of milieudefensie and thinks it is important to partake in the march: “I think it’s a good thing that we show the world, or at least our fellow countrymen and women, that more needs to be done than we currently do to prevent climate change”. He looks at the crowd moving in front of him. The rain is collected in puddles on the pavement, people don’t seem to notice that their ankles get splashed and muddied, they are still happily chanting their protest songs. Mark took some time to find his words: “The government should…” He stammers for a bit, looking into the distance. “Most big companies are polluters, and I think they could do more about that”. He hasn’t been with Milieudefensie long, this is his first big event as a member. He continues the march that has now entered its final part before the big conclusion at the Museum quarter. The protesters continue their march peacefully. Everybody is jolly despite the bleak weather conditions. Nobody cares that their signs are falling apart, or that their jeans are soaking wet. They do care about the climate, the world, their own influence and the future that creeps closer with every passing second. The brass clock on the old Heineken brewery turned tourist attraction says that it is almost 4 p.m. The march is almost over, but the conversation has just gotten started.